During my first year of blogging, when November, 2008 rolled around, I had no idea what NaBloPoMo meant. After reading blog after blog that was participating in NaBloPoMo, I had to resort to Google to figure out that it means National Blog Posting Month. 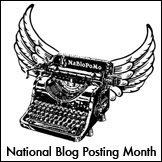 It’s the bloggers’ version of NaNoWriMo, which is National Novel Writing Month. (I had to Google that, too.) Instead of writing a 50,000-word novel, however, bloggers just need to write a daily post. So when November 2009 came around, I decided to go for it! Little did I know that November of 2009 would be the longest month of my life, but not because of NaBloPoMo. My mom became ill and died that month, and NaBloPoMo became a way to keep family and friends informed of what was going on. Writing also became a therapist’s couch for me that Fall. Fortunately, November of 2010 was not quite so dramatic. I “met” some other bloggers who were also participating in NaBloPoMo. We visited one another’s blogs during the month to encourage each other to keep writing! We still visit each other’s blogs and leave comments. When November 2011 came around, I suddenly lost my mind. For some unknown reason, I decided it was finally time to switch from Blogger to WordPress even though I was posting every day. I mean, I like a challenge, but that was ridiculous! Hopefully this November, I’ll avoid biting off more than I can chew. After all, I don’t have any big projects looming ahead of me. Except for that whole “finish a quilt by December” class I’m participating in. Thanks, Mara! I hope all is going well with you…I'm going to go read your blog now! Wow! I'm impressed by anyone switching from Blogger to WordPress in the first place (I'm not good at techie stuff), let alone while posting every day.